The Jehovah's Witness - Who Are They and What Do They Teach? Almost everyone has come across a Watch Tower or Awake magazine at some point in their life. 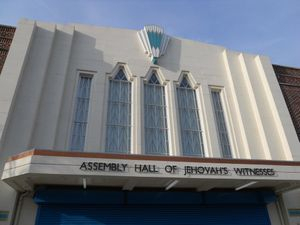 Or maybe you've seen their Assembly Halls or you've opened your front door to find a couple of Jehovah's Witnesses standing there wanting to tell you about their faith. Well, this website will tell you who Jehovah's Witness is and what they teach in their Watch Tower and Awake magazines so you can be prepared to refute them before they get you ensnared in their false gospel. Jehovah's Witness religion began in 1872 by Charles Taze Russell who began his own Bible study class to teach his own beliefs on Christianity. He did not believe in an eternal hell for the unsaved, nor did he believe in the Trinity, Deity of Christ or the Holy Spirit. In 1879 he published a magazine to spread his teachings further and this first magazine later was renamed to The Watch Tower Announcing Jehovah's Kingdom. He also began a tract society that we now know as Watch Tower Bible and Tract Society. Russell claimed that the Bible could only be interpreted according to his teachings which is a known foundation for the making of a cult. Quick question, which applies to all denominations or religions that have a start date such as this one does - How can they be the true Gospel when the Gospel began with Jesus and the Apostles? Do these denominations and religions want us to believe that God had no true witness for Him all the years between the time of the Apostle's deaths until their leader created their group? Another sign of a cult to be aware of. When he died another man named Joseph Franklin Rutherford took over the tract society organization and in 1931 he renamed it The Jehovah's Witnesses. The Society went on to have several presidents after Rutherford and in 1970 Jehovah's Witnesses adopted the idea of governing body which took control of the decisions and publications rather than entrusting it to one man, the president. The Watch Tower was the first to announce the governing body but made it seem like it had always been in place but just had never been mentioned before. The Watch Tower, January 15, 1994 on page 6 said this: "In 1919that slave was identified as the remnant of anointed Christians. Since then, as represented by the Governing Body of Jehovah's Witnesses, it has been the center of theocracy on earth." See the Jehovah's Witness see themselves as the "Discreet Slave" that Jesus referred to in Matthew 24:45-47: "Who then is a faithful and wise servant, whom his lord hath made ruler over his household, to give them meat in due season? Blessed is that servant, whom his lord when he cometh shall find so doing. Verily I say unto you, That he shall make him ruler over all his goods." The problem with the Jehovah's Witness' interpretation of this Scripture is that Jesus is teaching individuals how to behave while he is away and the reward he will get in heaven, he is not stating there will be an organization that will be the authority over all believers here on earth. A cult will use Scripture to try and assert their power over others and they of course twist it in order to confuse people. They witness door to door and hope they can reach people who have never read the Bible so they can easily be manipulated. Once a person decides to become a Jehovah's Witness they are forbidden to take any literature from anyone other than a Jehovah's Witness 'lest they become deceived' and they are also forbidden to enter any church other than a Jehovah's Witness temple. So the mind-control of the Jehovah's Witness Society is another sure way of recognizing they are a cult. Failed prophecies abound in this cult, just like in the Seventh Day Adventist religion. The founder, Charles T. Russel predicted the world would end 1914 and when it didn't he changed it to say 'Jesus had returned to earth but was invisible'. Rutherford kept on with the 1914 prediction by saying that anyone born in that year would be around to see Armaggedon. In 1925 Rutherford announced that Abraham, Isaac, Jacob and the prophets were to return so he prepared a mansion, Beth Sarim in San Diego, where they could live. Once ready he moved in himself (he also died there in 1942) and purchased a car so he could drive Abraham etc. about once they were resurrected. After he died and a couple of leaders later Jehovah's Witness teachings touted 1975 as the year of Armageddon. In 1995 they changed their position to be "Armageddon would happen soon". So clearly within Jehovah's Witness Society we can see another sign of a cult which is failed prophecies. Lastly let's look at the Jehovah's Witness Bible - the New World Translation. The New World Translation (NWT) altered hundreds of King James Bible (KJB) verses in it's first edition. Every few years it revises more verses to fit with the ever changing Jehovah's Witness doctrine. So how can the NWT be the solid rock of truth? In the KJB in Genesis 1:2b it says, "And the Spirit of God moved upon the face of the waters". It does not say as the NWT states - God's active force. The Holy Spirit is not a force (like something from Star Wars), He is the 3rd person of the Godhead. In the KJB in John 1:1 it says, "In the beginning was the Word and the Word was with God and the Word was God. The NWT states the Word was a god. Jehovah's Witness teaches Jesus was Michael the Archangel who became a man so they added an 'a' and made the G lower case to try and take away Christ's divinity. In the KJB in Galatians 6:14a says, "But God forbid I should glory save in the cross of our Lord Jesus Christ. But the NWT teaches Jesus was crucified on a stake. Since Jesus had nail pierced hands it would make sense he was crucified on a cross, not a stake. Jehovah's Witness negate the cross because they say it is pagan but they twist this nonsensically because history proves Romans crucified people on a cross. In the KJB in Matthew 5:29, 10:28 & 23:33 as well as Luke 16:19-31, Jesus taught that hell is real and it is everlasting. These verses also prove there is a conscious existence after death. Jehovah's Witness teaches something called 'soul sleep" which means a person ceases knowing anything after they die, that they are annihilated until the future resurrection where their soul is created again. Seventh Day Adventists teach 'soul sleep' also but their version is that the person ceases to exist except in the mind of God. In the KJB in Luke 24:40-43 we learn that Jesus bodily resurrected so he can not be Michael the Archangel. Also verses Luke 22:69, Ephesians 1:20, Colossians 3:1 and Hebrews 1:13 all state Jesus is seated at the right hand of God the Father and that God never invited an angel to sit at his right hand. In the KJB in Romans 1:17, 3:28 and all of chapter 4, as well as Ephesians 2:8-9, Galatians 2:16, 3:8-11 salvation is explained as 'faith in Christ alone', not by works. Yet Jehovah's Witness teaches a person is saved by works. The reason they are so faithful to door-to-door witnessing is they are taught they have to have a certain amount of converts to get into heaven. The number they need? Well they don't know, they just believe that only 144,000 witnesses will get into heaven, so they have to try real hard to be one of those 144,000. Isn't that sad? What kind of peace can a Jehovah's Witness have with that kind of belief system? None. So, Jehovah's Witness proves over and over again by their teachings they are a cult through-and-through. One last word of warning, the Bible says in II John 1:10 - If there come any unto you, and bring not this doctrine, receive him not into your house, neither bid him God speed. This verse is very important to remember with Jehovah's Witnesses because they mostly travel in twos and are very aggressive in trying to get recruits. A personal story that happened to me is one Sunday while I was out street witnessing a Jehovah's witness man came up to me to see if I was representing them and more accurately if he could get me to represent them. He thanked me for my street witnessing and I was abrupt and said "I am not doing it for you or the Jehovah's Witness. I continued to be firm in my rebuffs and he left. The next week he showed back up with an elder from his church. He thought I would be convinced if he brought someone more versed in witnessing. I turned them both away with words and a tract designed to tell them the truth about their religion. They left the tract on the ground and drove off never to be seen again. A few months later a couple of Jehovah's Witness women came up to me with large smiles and very sweet dispositions. The main speaker held up her Watch Tower magazine which had a picture of a likeness of Jesus on it. I say likeness because no one knows for sure what Jesus looked like. But she was sure that by holding up this picture I would think of them as the same as I was, a Christian. I was quick to point out to her that they teach a different Jesus than who I believe in. She was dumbfounded and said "I didn't know there was another Jesus" and I replied "oh, yes, your organization has created a different Jesus than the Bible, just like the New Agers, the Catholics and other cults". She and her friend hurried away. I prayed my response would open their mind to the truth so they can look into how their gospel is no gospel at all and so they can turn to the true Jesus and be saved.